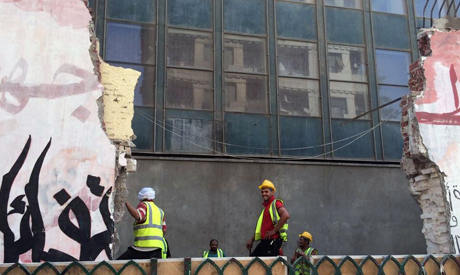 A group of workers have started demolishing the famous Mohamed Mahmoud Street graffiti wall Thursday at the American University in Cairo (AUC) building in Tahrir Square as part of a renovation project. When asked about who was behind the demolition, the workers at the site told Ahram Online that it was an order by the Cairo governorate. The AUC's media office told Ahram Online that demolishing the university's walls in Mohamed Mahmoud Street was part of a renovation plan which included tearing down the university's science building. "The walls need to be brought down so the demolition equipment can enter," the media office said, adding that tearing down the science building, which was severely damaged during the January revolution, was part of the plan to renovate the Tahrir Square. According to the AUC media centre, the science building in Tahrir has not been used since the university moved to New Cairo in 2008, and its other buildings in Tahrir are now used as a cultural hub. "That specific area will be turned into a garden with a fence to increase the green areas in Tahrir Square," the media office told Ahram Online. "The AUC documented in photographs all the graffiti paintings on the walls of its Tahrir campus since 2011, and those photos will be used in exhibitions," the media office added. Cairo's Mohamed Mahmoud Street has been associated with revolutionary political graffiti in Egypt since November 2011, as the street has seen numerous infamous clashes between protesters and security forces. In September 2012, graffiti covering the walls of Mohamed Mahmoud Street was painted over by Cairo governorate authorities. Nevertheless, graffiti artists soon returned and painted new images. Young graffiti artists have altered several of the street's murals, especially the ones on the walls of the AUC building, to suit the current political situation in the country.